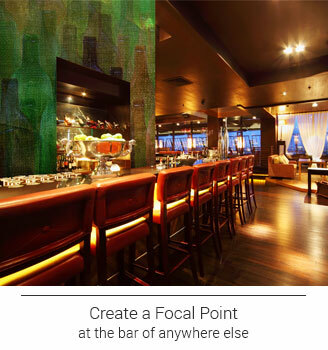 For bar managers looking to solidify their brand, create more ambiance and set the right mood inside and outside of the club, Magic Murals offers economical wall murals, graphics, and other wallcovering solutions and the expert service and advice required to complete your design projects on time, on budget and with only the most pleasant of surprises. Whether you’re running a corner bar where everybody knows your name, a huge nightclub with multiple VIP rooms and dance floors where your name’s got to be on the list in order to get in, or something in between like a sports bar, Irish pub, wine bar, local brewery, tavern or dance club, we’ve got the images, the materials, the graphic designers and the know-how to take your plans from idea to implementation. We understand what your bar and your brand means to you. 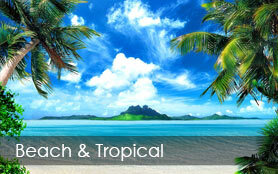 We’re here to provide creative, cost effective solutions that promote your business and enhance your décor. Our experienced mural and design experts will help you every step of the way, just like we've done for thousands of other businesses. We'll work with graphics and artwork you and your designers supply or we can serve as your design team, creating and incorporating logos, trademarks and other custom art into graphics and signage that builds your brand and your business. 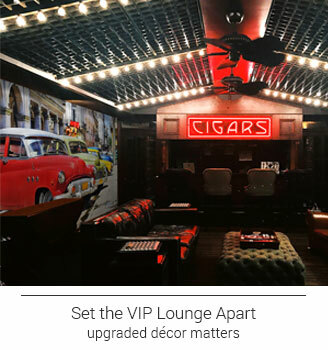 We can even work with your vendors to upgrade those promotional posters to décor that’s actually upscale. Our custom graphics & visual marketing solutions include interior and exterior wall murals, window, door & wall graphics, floor graphics and more. We’ve got the right materials for every project on your list. 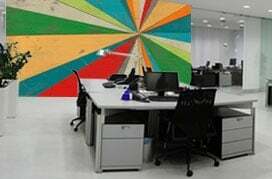 Our standard materials include: self-adhesive/peel-and-stick wall murals and Type II commercial wallcoverings for internal use, heat applied color graphics for masonry and hanging banners for external use, and perforated window film and other clings. If you’ve got a surface that you want covered with high-impact graphics that will grow your business, we’ve got the solution. 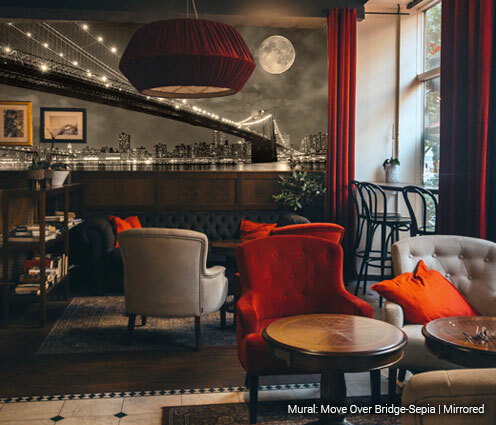 To shop our collection of Bar & Nightclub Murals, click here. 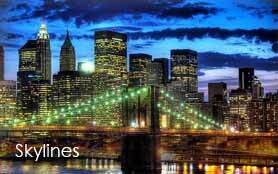 Complete the Bars & Nighclubs Request Form below for our exclusive offers. Please include your mailing address to receive our Swatch Kit ONE, mailed via U.S. Postal Service. Sure… there are some speakeasies and nightclubs that market themselves by not marketing themselves and making the most of the “exclusivity of anonymity.” If that’s not part of your business plan, however, then make sure your potential patrons see you easily from the street during both the daytime and the night. If you have an external wall, made of brick, masonry or concrete block, we have heat-applied color graphics that will permanently apply your business name, logos and other marketing messages right onto the side of your building. You can go from bold colors and a fully modern, freshly-painted wall mural look to something with vintage appeal that makes it seem like you’ve been clubbing since the days of the Charleston and the Lindy. 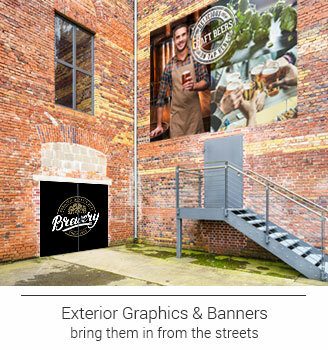 If the outside walls are beyond your reach, we have a variety of banners that might serve your needs of getting those party people off the streets and into your seats. Whether you’re using wall graphics or banners, your business will benefit from their visibility and exposure during the day when folks are making their plans for the evening or weekend. At night, light them up as a beacon leading to the good times your club offers. Not all bars and nightclubs have external walls (particularly those located in malls, shopping centers and downtown areas), but chances are you have glass doors and large windows you can use to beckon folks inside. Before you can get them drinking and dancing, you’ve got to get them inside your doors. The right graphics and messaging can do it! Our Perforated Window Film is an excellent solution that presents your full color message to the outside world while allowing diffused light to flow into your facility and everyone inside it to see out. This film can be used to cover an entire window or just a portion of it. “Window Perf” graphics are particularly suitable to Irish pubs, wine bars, brew pubs and other establishments that want that feeling of “bringing the outside in.” They also do a great job of beckoning those outside to come on in and join the fun. Additionally, perforated film helps to minimize excessive heat and harmful UV damage by providing a layer of "tint" – good for your clientele and good for your air conditioning bill! For signage that’s promoting club events or drink specials, we offer a variety of banners, pressure-sensitive window clings and other printed window films that can turn a passer-by into a guest for the evening. All of our window signage solutions are custom crafted to your specifications. Cover the entire window or just a portion of it. Allow various levels of light in with varying levels of transparency. 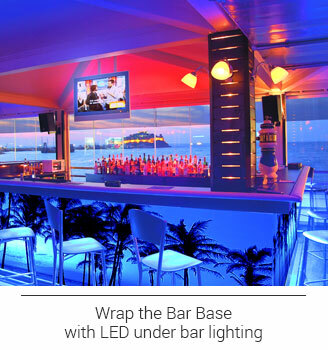 Or use our peel-and-stick, contour-cut decals and other isolated graphics, including ones that look like frosted glass, on windows and mirrors behind the bar or around the dance floor. 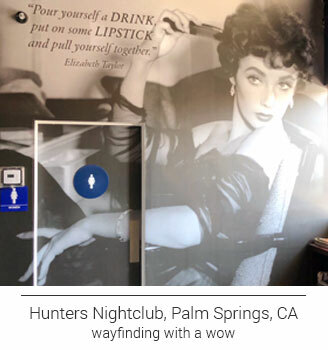 Our easy to install, peel-and-stick wall graphics and wallpaper wall murals provide the perfect custom-sized, custom-printed solutions for all of your signage and decorating needs. Build your clientele with wall graphics and large format photographs that reflect your brand from the moment they step in the door. Create an entry that immediately makes your guests feel welcome and lets them know they’ve come to the right place to unwind, get their party on and maybe make some friends. The view from the front door is what’s most likely to entice a potential guest from taking that first step inside. Your elite guests are expecting more than just top-notch service, they’re expecting an experience worthy of the extra cash they’re parting with that evening. 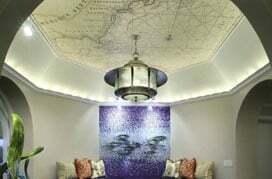 In addition to staffing and furniture, custom wall coverings can create an environment that provides an intimate ambiance or, just the opposite, rocks out loud or ups the bling factor. 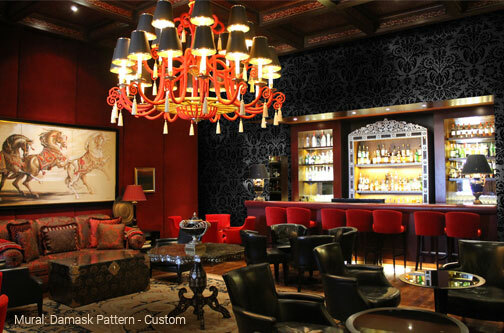 Our design experts can create wall coverings and graphics for you that are a little bit country or a whole lot of rock-n-roll. From a rap vibe to R&B, soul to jazz to EDM… we’ve got a playlist of images that can give your more private areas a special appeal. We can create custom graphics to wrap the top and sides of your bars and other service counters. These can be permanent or temporary for special promotions. Larger nightclub complexes benefit from excellent signage that guides their guests to the various amenities offered. Use graphics & text to point them to the restrooms, outdoor patios, billiards area, etc. Our RoughStik™ material can be used to create floor graphics that guide your guests even while they’re bent down looking at their cell phones. 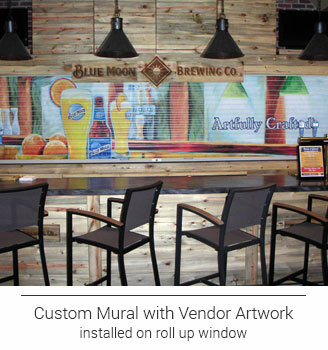 Due to our high volume of business and our state-of-the-art printing technology, you’re sure to find that Magic Murals provides far greater value, as well as significantly more options and solutions, than many of your local printers. When you work with us, however, you’ll find you still get that one-on-one service you’d expect to get from a neighborhood business. We pride ourselves on delivering 100% customer satisfaction, on time and on budget. 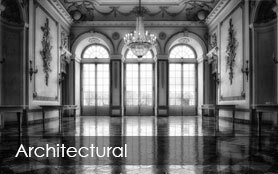 If you have designers and installers, we’ll work closely with them. 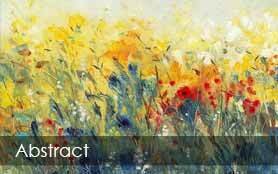 If you don’t, we provide custom design services at very reasonable prices. Our combined decades of experience can help you avoid common mistakes and create visual impact that contributes directly to your bottom line. We can also provide referrals to installation professionals in your area.